That somebody was me. Last year. I could probably blame some wacky 3rd trimester hormone cocktail but that’s just taking the easy way out. I was so looking forward to Mincemeat Pie for Christmas. Mom assured me it was taken care of. The night of the 23rd, mom called to break the bad news. Dad was apparently also looking forward to Mincemeat Pie. So much so that he couldn’t wait. He and an accomplice polished off the entire pie. It was after 9pm. I was not happy and I had very few options. I could have Christmas without mincemeat pie or I could run to the grocery store along with all the other last-minute shoppers. I was that desperate. There was no time to cook the filling for a new pie so I was looking for the jarred stuff. Nope. Or even a pre-made pie from the freezer. Double nope. I scored a jar at the third and final store we checked. The cashier looked at the pregnant chick with the red, puffy eyes with pity. She grabbed my wrist, looked me in the eye, and very kindly wished me a Merry Christmas. There is no telling what was running through her mind! To protect Dad from temptation, I handled Mincemeat Pie duties this year. I did not have the luxury of being able to babysit a bubbling pot of pie filling for 3+ hours (I had to babysit a real baby!) so I cooked it in the crockpot. (I used the crockpot for something other than sandwiches – add that to your list of Christmas Miracles!). I did end up with about a cup of extra liquid at the end, so I dumped it in a pot on the stove and cooked it for 7-10 minutes over medium high to reduce the liquid. It was perfect! There’s no meat in this pie! It’s a spicy, clovey, citrusy, Christmasy blend of finely chopped fruits and berries. And Christmas wouldn’t have been Christmas with out it. * You can use already candied orange peel or... Peel the oranges with a vegetable peeler - this will leave the pith behind. Place the peel in a small saucepan with 1 cup water and white sugar. Bring to a boil, reduce heat and simmer for 20 minutes until the liquid has reduced by half. Drain, reserving 1/4 cup of the orange syrup. Chop the peel into small pieces. Juice one of the oranges and add the juice to the reserved syrup. Reserve the second orange for another use (I removed the pith and ate it!). Place all ingredients for the filling (including the candied orange peel, juice, and reserved syrup) in your crockpot. Stir to mix. Cook 8-10 hours on low until darkened and thickened to a jam-like consistency. (If you feel your filling is too liquidy, put it on the stove and reduce it 'til it gets thicker). Place the oven rack in the middle and preheat to 400. Place a baking sheet on the bottom rack to catch any drips. Roll out your pie crust into two rounds. Transfer one dough round to a deep-dish, 9-inch pie plate, you should have some overhang (leave that in place). Spoon filling into pie shell and cover with the second dough round. Flute edge and cut 3-4 slits in the top of the pie. Brush with egg wash.
Bake until crust is light golden brown, 25 minutes. Reduce oven temperature to 350 degrees and bake until crust is deep golden brown. Transfer pie to wire rack and cool to room temperature before serving. Fruit mince pies are one of my favorites during the holiday season. I can totally understand you disappointment at the whole pie disappearing. That is why I love being in Australia (if I can) at Christmas time. Mince pies are in every store – big pies and little tarts. I have never made my own mincemeat filling. Thanks for the recipe. I haven’t had a mince pie since childhood but I do remember it being wonderful. This looks stellar! 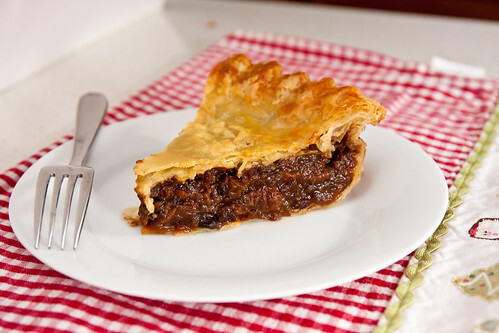 I have never tasted mincemeat pie…it looks like I have been missing out! 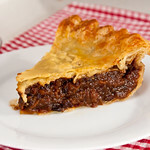 I never actually realized that mincemeat pie had no meat. Hm. Guess I have been missing out as well!! Think this will have to be on my to-make list soon! Just one question, do you cool the filling before placing it in the pie crust? Thanks so much for your recipe. Unfortunately, the purchased jar of horrible, wretched, runny “stuff” I used for my my mincemeat tarts this year just didn’t fit the bill. My mom used to make mincemeat tarts at my request every Christmas for as long as I remember and I never got her recipe while I had the opportunity. Thanks for the chance to make the real thing for next year. @Anne, I actually did because I made it the day before i wanted to make the pie. I left the filling in the fridge overnight. Thanks for your quick reply. No one in my family likes mincemeat but me so baking the tarts is my Christmas gift to myself. I was about to end that tradition after so many disappointing jars of “crud” until this recipe came to my rescue. Shawnda, you are an angel! Can I use brandy flavoring rather than alcohol? If so, how much brandy flavoring would equal the 1/3 cup of alcohol? I don’t have any experience with brandy extract but Cook’s Thesaurus suggests the substitution 1 tablespoon brandy extract = 5 tablespoons brandy. I would start with half of that and add more to taste. Good luck! I’m really looking forward to making this tonight myself. I can’t wait to try this Mincemeat Pie recipe!!! This pie has always meant Christmas to me also. My sister and I love it! Thank You for posting it. As for right now I will be making your Fresh Strawberry Cake today for my 25 year olds birthday! I Love this recipe! 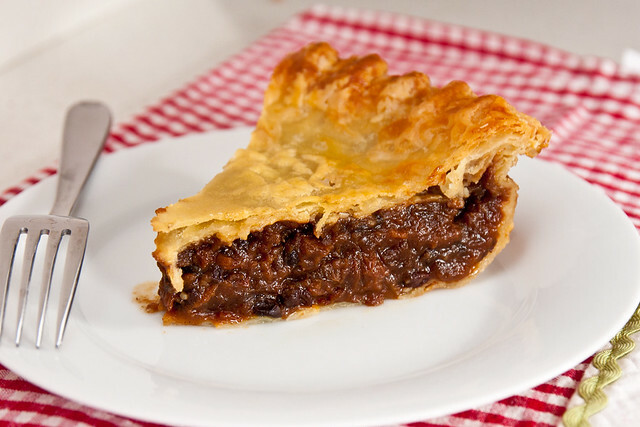 I love mincemeat pies….the only one in my family also. Never made one, but Iam sure going to try this one! I think I will make 4 mini pies…and freeze the other 3 for later….Hope this recipe will lend itself to the freezing! Thank You! This recipe looks great. The one I have been using isn’t cooked and can be made weeks in advance and refrigerated. Do you think I can make this a week in advance and refrigerate? Thanks. I wouldn’t refrigerate the filling made that far ahead, I’d freeze it instead. Hi! Is there any possible way to make this in a pot on the stove? Thanks! Yes – you’ll cook it on low for about 2.5-3 hours, until everything has darkened and looks more like jam. OMG!! I tasted the sauce and it is delicious. I’ll put it in the crockpot when we get home this evening and let it cook over night. I’ll be back to let you know how it tastes cooked. I used suet instead of butter and brandy instead of rum. I ended up having to have to cook it stove top for an additional 1:45 minutes to thicken it up. Next year, I’ll cook it on the stove top instead of the crockpot. Thanks for the recipe. Happy Thanksgiving! That is exactly what my mother used to make when I lived up north. Now down here in the south they do not make it at all. That is exactly how my mother made the pies around the holidays. Thank God I found this site. Thank you for sharing this dish with all. You all have a Happy Holidays. I made this pie for my husband who had been requesting one for awhile, because his late mother used to make them (we did not have her recipe and this type of pie was unfamiliar to me). He said your recipe “hit the mother lode”! Thank you, thank you, thank you, for sharing this. I used brandy (like his Mom used) instead of rum and reduced the sugar while making the candied orange to 1/2 c. Also, since I could not find currants, instead I used 1/2 c. dark raisins with 1/2 c. chopped dates. I have never been a fan of Mince Pie prior, but since this delicious one – I can hardly wait to eat the next one! I appreciate this so much. In the old days there was actually meat in mince pies. Only the best of the best gets this comment: This recipe was absolutely stunningly incredibly delicious! I had never liked mince pie before, but now I am craving it all year! My husband had been opining about his late mother’s pie and no one had the recipe. When I made this, he said that I “hit the ball out of the park!” The only modifications I made was using brandy (because his mother did) instead of rum, replacing currants with dates (because I could not find currants) and reduced the sugar slightly. I will now be doubling the recipe and this is a family staple. I cannot thank you enough for sharing this and helping me to fulfil my husband’s wish!! !